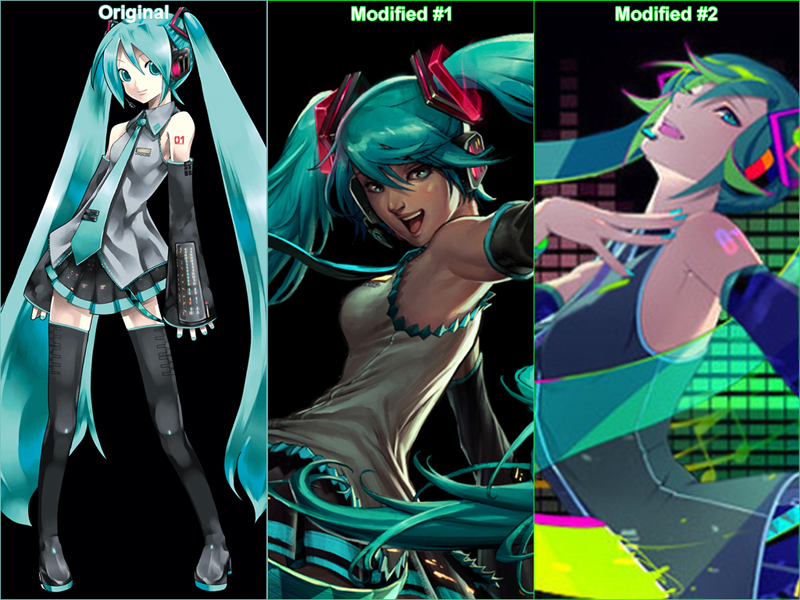 The picture you see on the left is the original Hatsune Miku from Vocaloid, the picture in the middle is the modified version of her while the other picture is the re-modified version of the modified version. The original Miku you see are used to advertise many things in Japan and other Asian countries such as Thailand including for tourism purpose. About the 1# modified version of her is used to advertise one of Toyota new cars in america, as for the reason why the 2# modified version exist is because of Vocaloid especially Miku fans are angry at what Toyota did who advertise their cars using Miku's image who totally not look like her so Toyota re-modify her appearance to try to calm the angry Vocaloid fans, even so the re-modified version of her are still not calming the angry Vocaloid fans because her appearance are still look very different from the original Miku. 1. In mind the american Toyota staffs think that Anime characters appearance will look less appealing to the majority of americans because they think the big majority of american are not Anime fans, the appearance they think that will look appealing for the big majority of american would be westerners based appearance. Toyota should just fire all of the american Toyota staff who are responsible for the ads because other than making more peoples [ Vocaloid fans ] to hate Toyota, they also don't know the latest trend so they are just wasting money with the useless and back-firing ads. 2. Some of the american Toyota staffs including who are reponsible for the ads are members of the racist westerners kkk movement especially with the fact that the movement still exist to this day, they don't want Anime characters which not based on westerners appearance to take over in america including to take over the beauty standard in america. Just for info that beauty standard is the main factor to consider when advertising something and each countries have their own beauty standard, that beauty standard will be similar to countries who's population are of the same race just like what the original Miku proven who are used to promote things not just in Japan but also other Asian countries. Back to the subject, as you can see the modified version just look totally different from the original version, that is because the original version are made based on Asians appearance which is why she just end up look like other typical Anime characters while the modified version are made based on westerners appearance. About the re-modified version, the appearance still look similar to the modified version except that her face are shown less with the intention to make her different appearance to look less suspectible to the Vocaloid fans who protest what Toyota did. As you can see the modified version just have deep set eyes, big long nose, etc not how typical Anime characters are supposed to look like which are based on Asians who have narrow set eyes, small nose, round face, sharp jaw and smallish body form. The anger Vocaloid fans feel at what Toyota did are the same as how Anime fans feel towards western cosplayers who always ruining Anime characters by keep cosplaying Anime characters while look nothing like Anime characters.